Top platform adjusts in height to meet your specific needs. Middle platform extends out for easy access to laptop. Lower wrap-lock stability panel provides convenient storage for supplies and accessories. Wheels roll for mobility and lock for security. 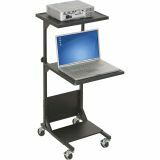 MooreCo PBL Adjustable Height Projection Stand - Height adjustable LCD projector/laptop stand offers a top platform that adjusts from 41-1/2 to 47-1/2" in height. Middle platform extends outward for easy access to laptop. 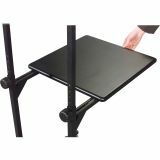 Lower wrap-lock stability panel provides storage for supplies and accessories. 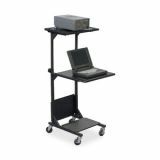 3" casters (two locking) deliver mobility and stability."